At the beach, the pool, or even just in the sprinkler, the GroVia Swim Diaper will contain accidents so your baby can focus on fun! 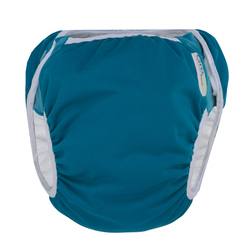 The GroVia Swim Diaper is the perfect reusable swim diaper for the beach, pool, or even just a run through the sprinkler. 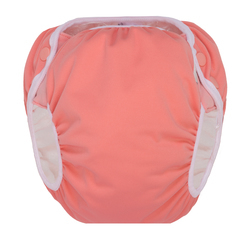 This swim diaper will contain messes while your babe has fun in the water. The soft terry inner is gentle against baby's skin, while the stretch side tabs provide a perfect, custom fit. Side snaps on either hip allow for easy clean up of messes. Available in your favorite GroVia prints. 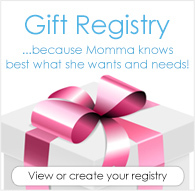 **If your child falls between two sizes or is in the lower weight range, you may want to size down for a snug fit. Fiber Content: Inner fabric constructed of 88% Polyester, 12% Cotton. Outer fabric constructed of 100% Water Resistant Polyester TPU (exclusive of trim). Care Instructions: Remove solid matter and place in a dry diaper pail or bag for storage until washing time. Wash on warm with detergent as needed. Tumble dry low. No bleach. No fabric softener. I bought size 3 for my 20 month old. On the smallest snap it fits her waist and around legs perfectly, but it's a bit droopy in the bum. Size 2 might have been better. 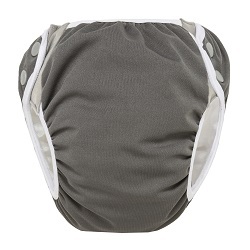 It's SO soft and comfy with the stretchy tabs and terry cloth, but holds a little too much water, so my toddler gets uncomfortable and takes it off. Maybe a more snug fit would help solve the problem. We prefer our Thirsties swim. I am in love with this swim diaper! It fits so well and my little man looks so cute! 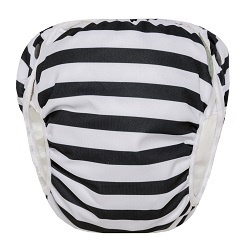 I bought the Grovia swim diaper in the onyx stripe and love it! The inside terry is soft against my LO's skin. The only complaint I have is that water sometimes collects in between the diaper layers and has to be squeezed out occasionally. Otherwise it's a great diaper! So soft and trim. Stretchy side tabs and snap adjustments on each side make it easy to get a great fit and easy on/easy off. The inside layer is fabric, so it's nice against the skin. Haven't used in the pool yet, but we tried it on and she pooped in it right away ;) Held in fine and washed out nicely!